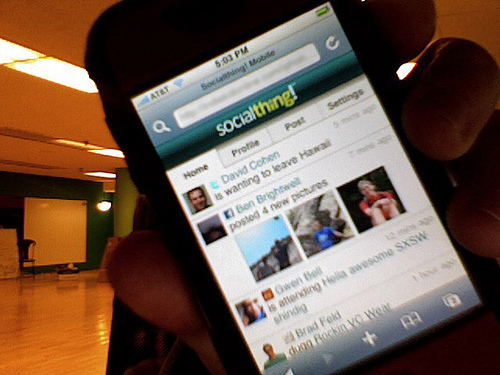 I’ve been chatting it up a bit lately with Matt Galligan who is one of the founders of Socialthing! which is a new Lifestreaming service that is currently in private beta. One of their distinguishing features is the ability to use the service as a dashboard to publish to other services. I’ll provide more details about them in an upcoming post, but today Matt sent me a sweet photo showing off their service running on an iPhone. Mark, thanks so much for the mention. I would point out, however, that we just built this today…and whereas it’s working…the data we were feeding it was prepared, not live data. This was basically so that we could demo it and see how it’s going to work.